Chatting about their personal stories and experiences, a half-dozen guests join in a discussion about ADHD. As part of ADHD Awareness Month, host Eric Tivers conducted a live-streaming broadcast on the Blab platform featuring members of the ADHD community providing their own perspectives, thoughts, and knowledge on the disorder that at least 15 million Americans have. October, 2015 is ADHD Awareness Month. Eric will be hosting weekly free adult study hall sessions during ADHD Awareness month. In these sessions, up to fifty people can take part in a live video conference room, during which time they handle “imbortant” tasks – those which are both important and boring. The One in 15 Million fundraising campaign to help fund CHADD is ongoing. It represents the approximate 15 million people in the United States currently with ADHD. Represented by the hashtag #OneIn15M, the One in 15 Million campaign seeks to help bring together those in CHADD with those millions others living with ADHD and to help raise money to keep the organization afloat. CHADD has spent the last 26 years working to build a solid research and science base for those dealing with ADHD. CHADD’s advocacy has directly resulted in those with ADHD being able to use an IEP, as opposed to having to apply for a 504 education plan. To help support CHADD, use the #OneIn15M hashtag, share posts from others that do, help others find information on ADHD, run a race specifically for the #OneIn15M campaign, and consider contributing a little to the crowd-funding effort at the campaign page. Attending his first CHADD Conference, Eric knew he was in a different place when the keynote speaker made special mention of those of the crowd who were late or forgot to turn their phones off, and said that it was okay. The next CHADD Conference will be held in New Orleans from November 12–14, 2015. Eric will be presenting “Hi-Tech & Low Tech Solutions for Supercharging Your Productivity”. 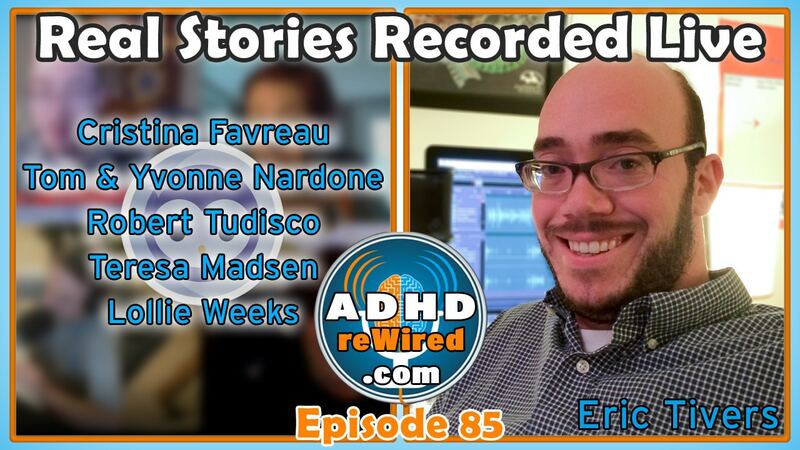 Rob Tudisco and Eric are sending out a call for videos of people telling their ADHD stories. The videos will be combined into one longer video production, which will be presented at the CHADD conference. Eric loves the increased social component of live interaction that the Blab platform provides. 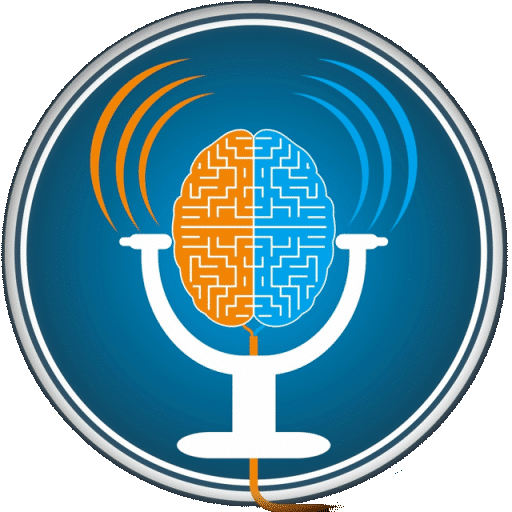 Cristina Favreau has been hosting daily Blab sessions for ADHD Awareness Month Through those she has been able to meet new people looking for help managing their ADHD and increasing their productivity. Cristina feels she was perceived as someone just coasting through school and applying minimum effort. It was challenging moving through school and life not understanding why she didn’t have the same fluency with learning and understanding that she saw in others. Eric: With the inattentive presentation of ADHD more common in women, many fall under the radar and aren’t diagnosed. Along with other hormonal changes throughout a woman’s life, ADHD can be especially challenging to diagnose while also potentially being more intense for the same reason. Tom is known for his theory of pants-wearing, where he equates them to car upholstery and hats in that people don’t normally wash them more than once per month. Eric: Many people notice their differences from other people due to ADHD and try to hide them as if they’re secret. This can lead to bearing a large burden of shame. As they’ve mentioned in past episodes, Tom and Yvonne sleep in separate bedrooms as part of their radical acceptance of their ADHD. Eric does this as well. Yvonne says sports and athletics saved her life. While in school, the only subjects she excelled in were in gym class and art class. Sports let her relieve a lot of her excess energy, allowed her to focus her attention, be self-aware, and learn life lessons. It wasn’t until she started taking medication that Yvonne felt she could finish college. “The more physical I am, the better I am.” Yvonne suffers from anxiety and if she isn’t regularly managing it with cardio and being mindful, it can become overwhelming. Rob is an attorney, non-profit consultant, and ADHD motivational speaker who is helping Eric with ADHD Awareness Month activities and the CHADD One of 15 Million fundraising campaign. Graduating from law school, Rob began work as a prosecutor in the Bronx DA’s office, which was a great job for his ADHD because of how hectic it was. However, upon beginning a private practice, he struggled with the timekeeping, billing, and organization of his business. After being diagnosed, he began involving himself in the ADHD community. As a child of a father educated as a math teacher, Rob was placed under a lot of pressure for his less-than-stellar math grades. When he tested well in a standardized test, instead of offering praise, his father used that as “proof” that his son had been slacking on the rest of his math. Rob wondered why he was being lectured for doing well. Teresa has a Ph.D. in neuroscience. She ran into a huge “wall” in her life while working on her dissertation because of how much of a structural change it was compared with regular coursework. The level of independence and self-direction needed for her large dissertation project was too much. Teresa was diagnosed during this time. Teresa mentions Brendan Mahan’s “Wall of Awful” concept – building a mental wall around engagement in activities at which one often fails – saying that she definitely hit that point in second grade after her teacher dumped Teresa’s desk out on the floor for forgetting to do her homework. Eric: People think that because you’re smart that you can’t have ADHD. Robert Tudisco: Rob brings up the point that there is a legal challenge present where schools try to argue that because a student isn’t failing their classes, they’re not eligible for services or support. There is no relationship between intelligence and ADHD or other learning disabilities. Many times, the work isn’t the problem, it’s the management of tasks. Lollie grew up in the “dark ages” before much was known about ADHD. Known as the Fortuitous Housewife, she blogs about her daily trials and tribulations. Recently, she’s expanded into mentoring parents of children with ADHD. Both of her sons are diagnosed with ADHD, though her eight-year-old son just recently (and surprisingly) so. Pulling on her own experiences in helping her and other’s children has been particularly helpful. When younger, although she scored fairly high on an IQ test, she performed poorly in school otherwise. Despite continual recommendations from her teachers that she be held back, Lollie’s mother insisted that, with the test results, she was either correctly placed or should be re-tested. Lollie’s goal now is to make sure parents receive every resource and as much information as they can. She hopes her life experience can be used as a lesson and example for future generations. Lollie: I always use the analogy of a radio. We’re all chugging along tuning in to the same song. Then, when someone with ADHD receives medication or specific management treatments, they realize that the static they were listening to wasn’t actually part of the song and they hear what a properly tuned the radio sounds like. Eric: The ADHD brain focuses on topics based on their proximity, not their priority. During hyper-focus people focus solely in one direction and don’t maintain enough mental resources to deal with other important tasks. If you stay in hyper-focus, you’re at risk of burning yourself out. If you like Eric’s idea of live streaming shows on the service Blab, Tweet at @erictivers and use the hashtag #blabrewired. You can also contact him via facebook.com/eric.tivers or email eric@erictivers.com. 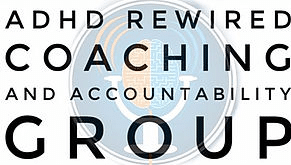 If you are interested in reserving a spot in the ADHD reWired Coaching and Accountability Group group, visit coachingrewired.com. Eric is collecting videos describing people’s experiences with CHADD. If you are currently involved with CHADD, record a video however you wish (horizontally, please!) of you describing your relationship to ADHD and what CHADD does for you. Send it to Eric via Facebook, Twitter, or email here: eric@erictivers.com. Help CHADD, an ADHD organization dedicated to improving the lives of those with ADHD through useful research and support, by donating to their fundraising campaign here: gofundme.com/oneof15m. Visit erictivers.com/audible for Carolyn D’Argenio’s list of her top Audible.com audio-book picks, complete with preview links. Connect with people virtually using Eric’s favorite video conferencing and connectivity platform, Zoom, by visiting erictivers.com/zoom – the basic service is totally free. 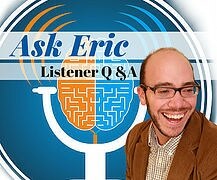 If you want you hear your question or comment on a future episode, go to erictivers.com/adhdrewired and look for the comment form, or click on the yellow button for either “Be a Guest” or “Record your question”. Are you looking for a coach? 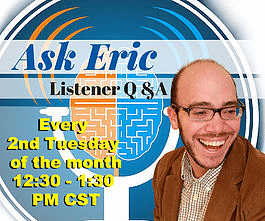 You can schedule a free 20-minute consultation with Eric. Go to erictivers.com and schedule an appointment.